The tool try-out and testing start at completion of all working activities. All tools are tested internally to verify their perfect functioning and to simulate normal production conditions before the deliveryto the user. 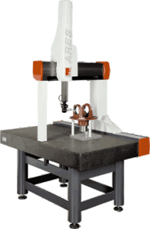 In the check room, a three-dimensional measuring machine verifies all dimensions of parts and tools to guarantee the clients' expected specifications, either during production or try-outs.